Roy Mooney, Mr. 7-1-71 First Day Cover, passed away on Sunday March 4 at the age of 88. He was singularly responsible for the popularity of collecting 7-1-71 FDCs. On July 1, 1971, the US Post Office Department became the US Postal Service. To celebrate the start of the USPS, a free cacheted envelope was made available at all US post offices and a new 8-cent stamp was issued. 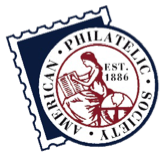 Collectors and non-collectors were encouraged to buy the new stamp and get the postmark of their local post office. Within days of July 1, Roy had started efforts to promote 7-1-71 first day cover collecting, which he named the "7-1-71 Affair". He published 15 of the first 16 editions of the 7-1-71 catalog (the 1997 edition was published by Harold Babb of Sunbelt Covers) before selling the catalog and business to Dave Wallman. his catalog and a bunch of covers. With the catalog, I inventoried my collection and discovered that I had over 20 unlisted Alabama 7-1-71 FDCs. Roy had the largest collection of Alabama 7-1-71s and I traded the 20 plus covers he needed for a large lot of New Jersey 7-1-71s. And I was hooked. Today, I have over 20,000 7-1-71 FDCs from about 16,000 different towns. 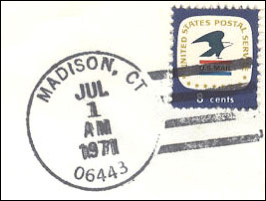 There were 39,353 post offices on July 1, 1971 and covers are now known from about 23,000 of the post offices. This is all due to the efforts of Roy. Roy Mooney served the American First Day Cover Society as its Recruitment Chairman and was active in a number of Society functions. Equally (maybe more) important to Roy was that he was a Pearl Harbor survivor, having been in the Army at Pearl Harbor on December 7, 1941. 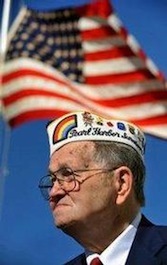 He never missed an opportunity to appear in uniform at a Pearl Harbor anniversary event. He was diagnosed with cancer last November but insisted on attending the December 7, 2011 remembrance in Atlanta. The photo above pictures Roy in uniform at one of the events. Survivors include his wife of 69 years, Evelyn Mooney, Cleveland; son and daughter-in-law, Don and Sandra Mooney, Gainesville, FL; sons, Ricky Mooney, Jonesboro; Steve Mooney, Elberton; Ken Mooney, Newnan; daughter, Susan Accola, Denver, CO; sister, Louise Brown, Smyrna; grandchildren, Susan Cooke, John Mooney, Chris Mooney, Alissa Mooney, Mark Mooney, Melisa Fincher, Matt Mooney, Candy Mooney, T.J. Accola and Paul Accola. Roy had an interesting personality, in part shaped by working as a prison guard. His phone calls and rambling letters were unique. He will be missed by all first day cover collectors.